The Garment District’s story has mirrored the many fashion designers who have called the neighborhood home over the years – entrepreneurial, dynamic and always on the brink of something really big. That “something big” has arrived and with such force, that it’s almost impossible to miss when crossing over into the Garment District, even for those New Yorkers who occasionally forget to look up. In the last six years alone, the District has welcomed 30 new hotels following new city zoning, bringing in 800,000 visitors a year. Venture out during the work day, and it’s clear it’s not all play, with an influx of TAMI (technology, advertising, media and information) firms now residing in many of the old fashion manufacturing factories, along with architectural, creative services and, of course, fashion offices. It’s also a transportation hub, home to the third busiest Metro stop in NYC. 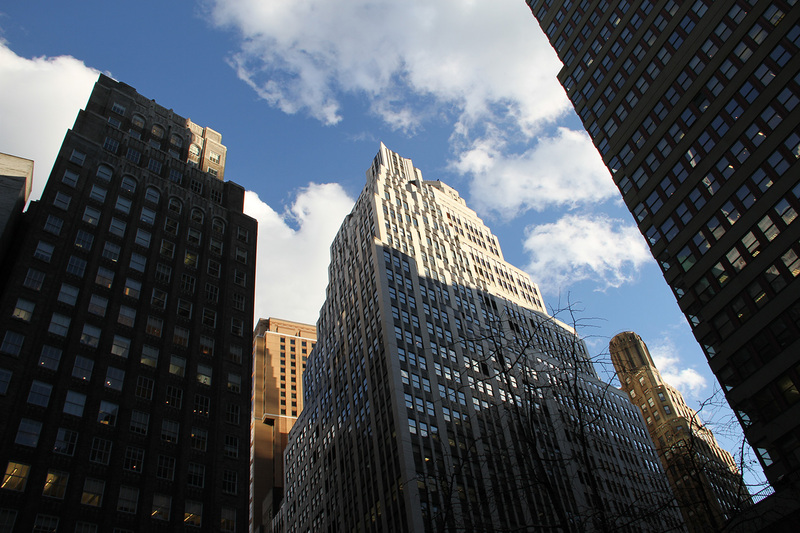 The Garment District has some well-known neighbors: Times Square and Bryant Park to the north; Herald Square, the Empire State Building and Macy’s to the south. 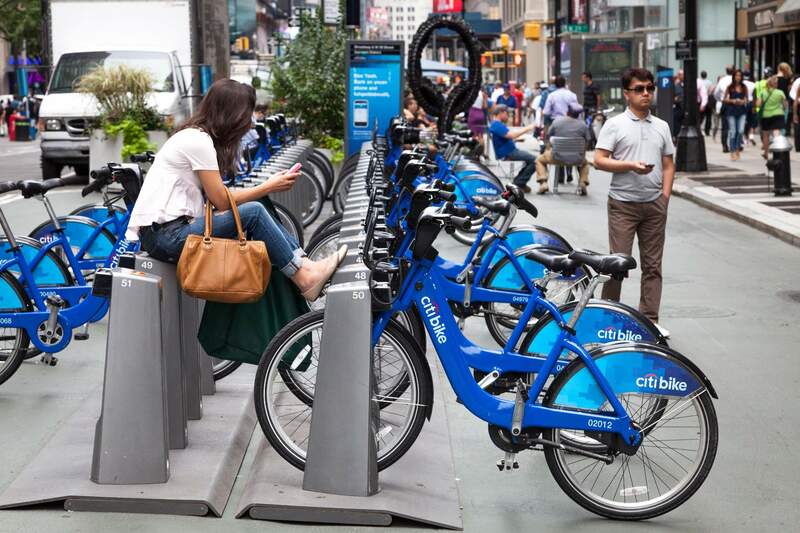 Yet its proximity to almost anywhere in Midtown Manhattan hasn’t always worked in its favor. As merchant trade picked up in the early 1900s and high-end department stores began to line 5th Avenue and Broadway, the idea of customers co-mingling with the Garment District’s factory workers didn’t bode well with merchants. As a result, zoning regulations were put in place to isolate the manufacturing hub from the rest of Manhattan. 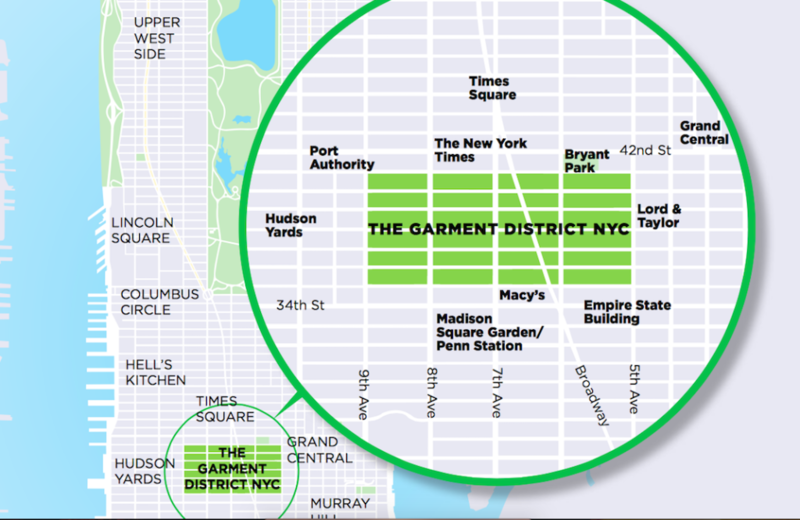 In turn, “Manhattan grew up around the Garment District,” Randall says. As production began moving overseas in the 50s, historical remnants remained — button stores, trim shops and wholesale fabric stores — and are now cornerstones of the bustling neighborhood. 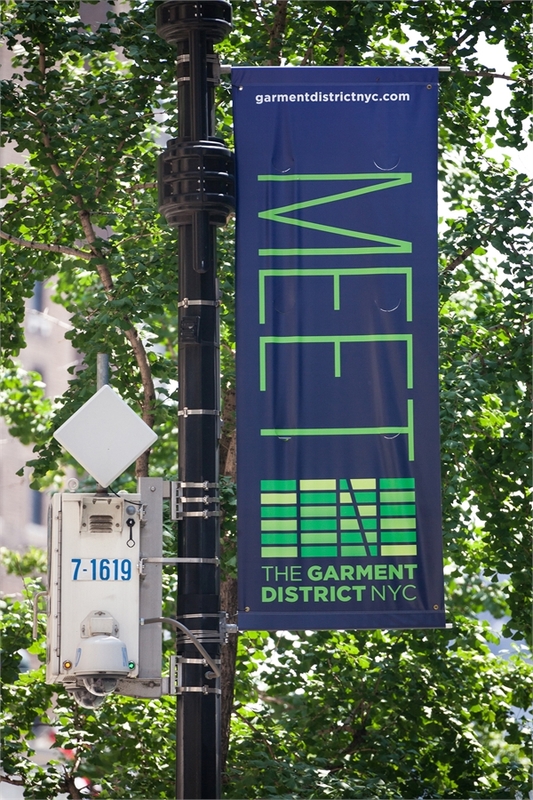 While the District’s growth may appear explosive over the past nine years, it has been 22 years in the making for Randall, who joined the Garment District Alliance after working for a trade association of fashion executives. 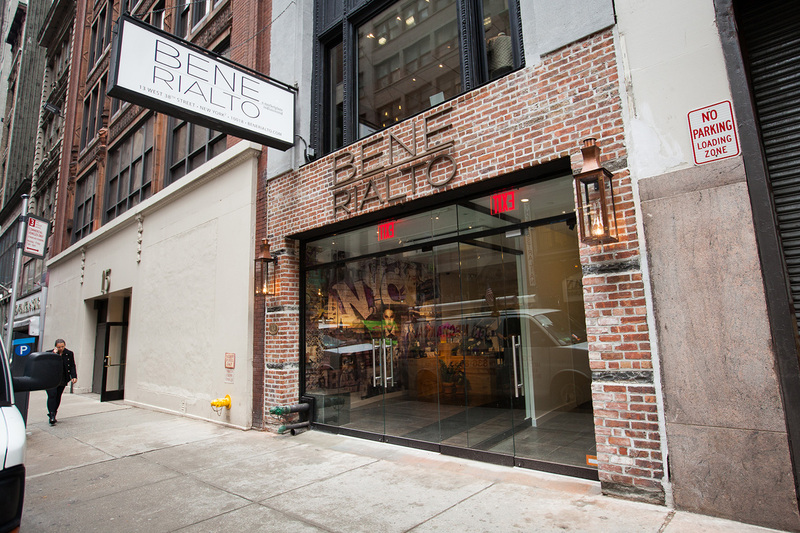 The retail has started to reflect this entirely new category of users, with larger branded products moving in on the avenues, and smaller independent boutiques, cafes, restaurants, chocolatiers and wine and cheese shops filling the side streets – a retail variety that is a natural result of the real estate floor plans. 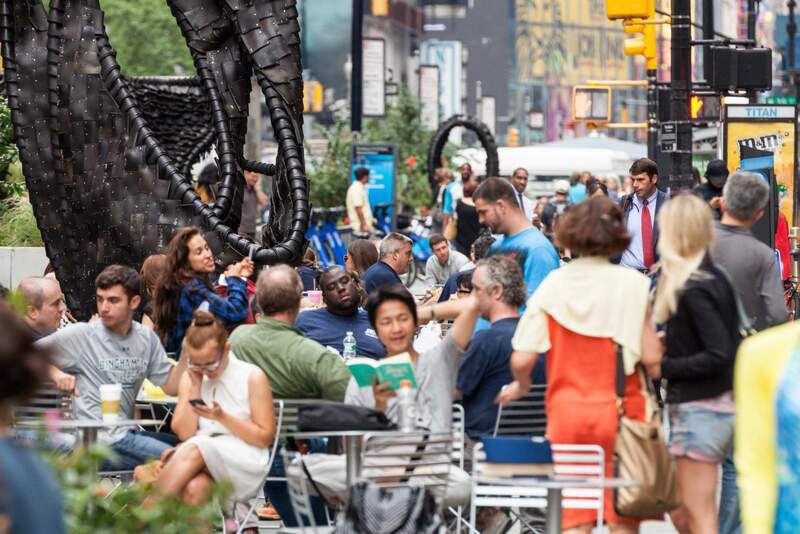 As pedestrian counts grow, so does the eagerness for added food options in the neighborhood. And while the idea of a chicken, a biscuit and cow may have seemed out-of-place in the Garment District many once knew, the neighborhood will soon be home to Chick-fil-A’s inaugural NYC store at 37th Street and 6th Avenue — a building owned by Garment District veteran M&J Trimming. Ryan Holmes, an urban strategy consultant with Chick-fil-A, is leading the expansion alongside an internal team that spans the company, studying and building upon what has worked at other urban Chick-fil-A locations including Chicago, D.C. and Los Angeles. “Our focus has been to adapt our operations and experience from the suburban environment to the urban environment,” says Holmes. One key element has been designing a restaurant that can physically handle the customer flow without compromising the customer experience. In the District, Randall predicts cravings will hit at lunchtime with heavy business, tourist and retail foot traffic. And certain high-profile neighbors won’t hurt either, with the store just three blocks north of Macy’s and Herald Square, three blocks south of Bryant Park, a block east of Broadway Boulevard, a block over from the Fashion Walk of Fame and next door to M&J Trimming. The location will also come with its own set of challenges, from middle-of-the-night supply deliveries for easier truck access to a refrigerated area to store trash until the evening pickup — a small city price to pay for the greater good. And what better place to explore than the Garment District – with all the world has to offer in less than one square mile.